This helps you repair the software on your Quanta device using your laptop/PC. The repair process may take up to 45-90 minutes. Do not disconnect the device from the computer during the repair process. The Windows and Mac process is identical. To use the Software Repair Assistant (SRA), ensure the wireless device is powered on and able to be unlocked if necessary then connect it to a compatible computer using the supplied USB cable. If the device is not recognized immediately, pull down the notification panel to switch the device mode from "Charge Only" to "Software Installation" mode. Ensure the wireless device is powered on, unlocked (if device lock-enabled), and connected to a compatible computer using the supplied USB cable. 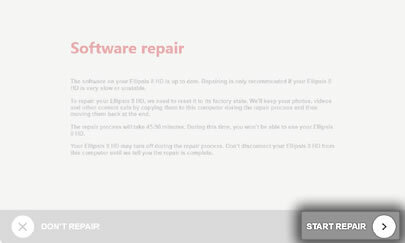 If the update fails to install or the device is up-to-date, from the Software repair screen click the START REPAIR button. On the Google Account Info Needed screen, click the "I know my Google account info" checkbox then click NEXT to begin the repair. 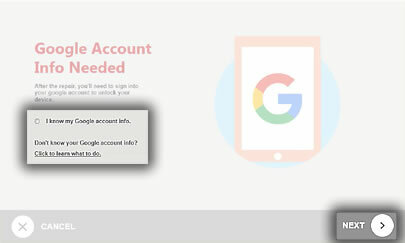 If the Google account info is unknown, click the "Click to learn what to do" link and follow the instructions to remove the Google account from the device. The repair may take up to 45-90 minutes to complete. From the "Now, It's Your Turn..." screen, unplug the Ellipsis, complete the Setup Wizard, and then plug the Ellipsis back into the computer and click NEXT. This restores the content to your device, which may take up to 10-15 minutes to complete. 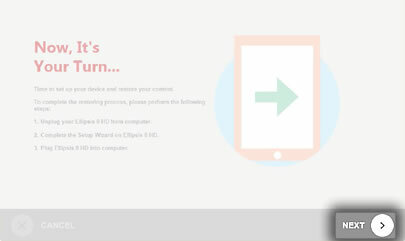 When the restoration process is complete, click EXIT and disconnect your device.